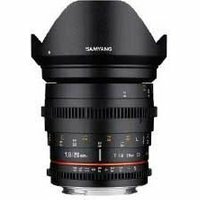 Designed for use with Canon full-frame DSLRs, the manual focus Samyang 20mm T1.9 VDSLR ED AS IF UMC Lens features a bright T1.9 aperture, 0.2m minimum focus distance, and 13 elements in 12 groups. 2 aspherical and 3 extra-low dispersion lenses prevent aberrations and light dispersion. Ideal for a variety of applications, this cine lens is optimally designed for professional follow focus systems.